The ANC Youth League (ANCYL) were political beasts under Julius Malema, but those days are gone and only the paper trails of alleged patronage remain. It’s now up to the courts to decide between legitimate business deals and corruption. The charges against Pule Mabe are the latest in a list that has rocked former youth leaders. By GREG NICOLSON. Barely two years ago, Mabe was the treasurer general of the ANC Youth League, walking side-by-side with Julius Malema on the road to economic freedom. It was Old Pretoria Road and Mabe flanked Juju, leading thousands of young comrades challenging the nation to speed up economic transformation and pressuring the ANC to relax disciplinary charges against Malema. Like Juju, he put in a decent slog, walking into the night, then sped past the stragglers towards the Union Buildings in the comforts of his car. But Mabe cowed to President Jacob Zuma’s force before his fellow Young Lions. It was a good political move. The ANCYL pretended to be determined to save Malema and Co. at last year’s elective conference in Mangaung. Forces were aligned for or against Zuma, the against rallying around reinstating Juju and backing a haphazard list of dissenters and politically ambitious politicians. The Anyone But Zuma crew suffered a humiliating defeat and the Youth League hardly whimpered. Even after trying to save themselves by cosying up to Zuma they were disbanded this year and placed under the administration of a task team. Mabe played the game. When he was viewed as a sympathiser to Zuma in 2012, he was dismissed from the Youth League, on the grounds of lobbying for the leadership (the ANCYL still considered Malema the top dog) and misappropriating funds. ANC leaders intervened and forced his reinstatement. The division, which defined the party before Mangaung, was sowed and Mabe ended the game on the right side of the field. For his services, he won a place in the party’s national executive committee (NEC), beating influential politicians (who were seen as being against Zuma) like Paul Mashatile and Fikile Mbalula. 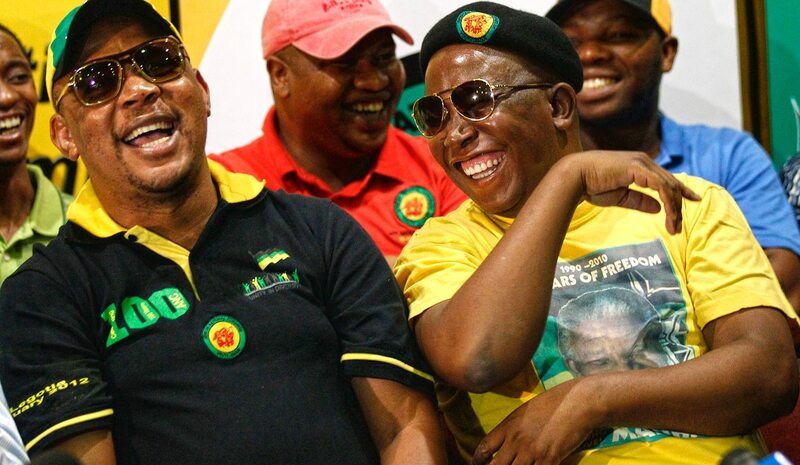 The ANCYL is these days fighting for its very survival, and Malema has formed the Economic Freedom Fighters (EFF), but the charges against Mabe go with the grain. He and co-accused Paseka Letsatsi and Kabedi Ramosa received R10,000 bail on Friday for allegedly defrauding the South African Social Security Agency (Sassa) of millions. Letsatsi is Sassa’s head of communications and Ramosa is reported to be Mabe’s business partner. Sunday World alleged Mabe gave R30,000 of the loot to former ANCYL spokesperson and current EFF member Floyd Shivambu. He believes Mabe wants to drag him down. “The police case against Pule Mabe does not mention my name as a beneficiary of the ‘stolen’ millions, [it] instead mentioned a number of recipients, most of whom are his private companies, his friends and family members, and the ANC Youth League which he paid R100,000,” said Shivambu on Sunday. He will ask Sunday World to withdraw their story, failing which he will take legal action. “I take this approach because it is apparent that the story was meant to cause damage to my character as a South African, and particularly as part of the collective of the EFF, which stands for accountability, open and corrupt-free society,” added Shivambu. Opposition parties are using the charges to discredit the ANC and assert their belief in a corruption-free society. The Democratic Alliance (DA) said it welcomes Mabe’s arrest. “If Mabe and his co-accused indeed defrauded Sassa of social grant funding, we hope that justice will prevail and that they will be brought to account. The DA will closely monitor this case to ensure that there is no political interference in the investigative and judicial processes,” said Mike Waters, DA shadow minister of social development. The ANC isn’t suspending Mabe from the NEC. (Innocent until proven guilty, right?) But the charges, in fact, reflect a worrying period of (alleged) corruption, fraud and money laundering when the Young Lions’ roared. Today, Malema is in court over the On-Point Engineering tender. Former National Youth Development Agency head Andile Lungisa is up on what could be termed charges of stupidity, allegedly stealing R2.5 million that was supposed to fund an R. Kelly concert (because R. Kelly is so important to youth development in SA and all). The Youth League is currently under a provisional liquidation order from the South Gauteng High Court after failing to pay for its 2008 Bloemfontein conference.